A period of prolonged instability followed in the defeat at the battle of Flodden Field, due in part to succession questions made paramount by the Protestant Reformation. Under the rule of James IV, the Catholic church had become a powerful entity, sowing the seeds of corruption that made the church ripe for reform. The teachings of Martin Luther began to arrive in Scotland from the Continent in the 1520s by way of the trading ports along the east coast. The reform ideas that were spilling across the English border struck the population so quickly, spreading to Scotland from England, that Parliament deemed it necessary to pass legislation protecting certain Catholic ideologies in 1541. By 1535, Henry VIII of England had broken free from papal authority, and began to pursue an alliance with Scotland against France and Rome. During the reign of Robert III of Scotland, Parliament confirmed that the Scottish Crown would henceforth be inherited by males in the line of Robert II's sons. Females would only be allowed to inherit the crown after the extinction of a male line. When James V, son of James IV, died in 1543, the House of Stewart was left without a direct, unquestionably legitimate male heir. 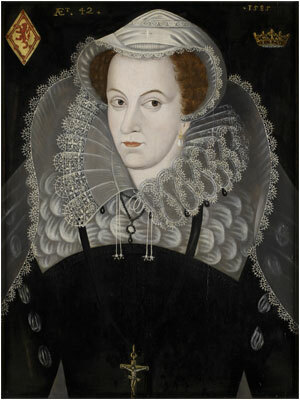 Thus, when James V died from cholera at the young age of thirty, his week-old daughter, Mary, became Queen of Scotland. 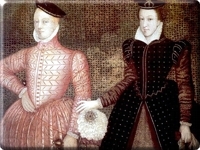 James Hamilton, 2nd Earl of Arran, the next in line for the throne after Mary; acted as her regent until 1554, when the Queen's mother, Mary of Guise, succeeded him. In a world where diplomacy and marriage were closely linked, the young Queen posed a threat to the English throne. 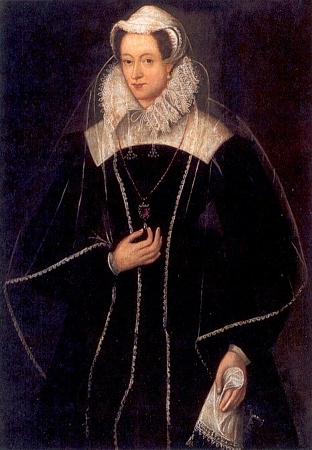 When her paternal grandmother, Margaret Tudor, had married into the Scottish royal family, the House of Stewart was brought into the English line of royal succession. While a Scot on the throne of England had seemed a distant improbability a half-century earlier, it became a matter of more concern for Henry VIII. After his son and two daughters, little Mary was Henry VIII's fourth heir to the English throne. 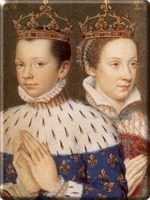 Henry sought to mitigate this potential threat by marrying his six-year-old son and heir, Edward, to the infant queen. The Earl of Arran, Regent of Scotland, agreed to the arrangement by signing the Treaty of Greenwich, which also stated that the children of this union would be heirs to the thrones of both Scotland and England. Scottish Parliament, however, balked at the prospect, knowing that the populace would not stand for such union with England, and broke both the engagement and the treaty within months. The young queen was coroneted in haste at the age of nine months as Henry prepared for war. A series of raids begun in 1544 accumulated into a devastating defeat at the Battle of Pinkie Cleugh in 1547. 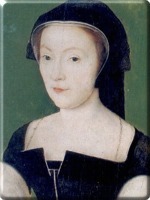 Mary of Guise, terrified that the English would kidnap her daughter, sent the child into hiding and sought the aid of France. 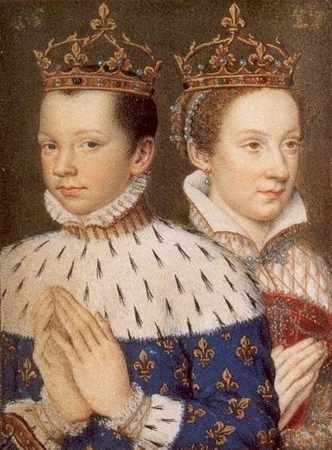 After supplying Scotland with military aid, France's new king, Henry II, suggested that he and Mary unite their nations through the marriage of their children. While Mary weighed her options, the English launched another invasion, seizing the strategically important town of Haddington. Mary betrothed the Queen to the Dauphin Francois, heir to the French throne, in 1548, and sent her to live in the Parisian court. Meanwhile, England was nearing a crisis of succession. Edward II died childless in 1553, leaving the throne to his sister, Margaret Tudor. After Mary Tudor died in 1558, Henry II of France claimed the throne of England for his daughter-in-law. Under the normal laws of succession, Mary was next in line to inherit the throne after her father's first cousin, Elizabeth. However, Elizabeth was illegitimate in the eyes of the Catholic Church, thus leaving Mary as the true heir. A long period of religious and political upheaval ensued. The country that had been so perturbed by an influx of Protestant teaching twenty years ago now whole-heartedly embraced them. Many of Scotland's leading nobility, including future regents James Stewart, 1st Earl of Moray, and John Erskine, 17th Earl of Mar, had converted to the reformed doctrine as well. John Knox returned to Edinburgh from Geneva to lead the Scottish Reformation in 1559, preaching fire and brimstone against the French Catholic Queen Regent, Mary of Guise. His sermons in Edinburgh and Perth incited riots; and when Mary brought in French soldiers to fight the Protestants, her own nobles regarded it as an act of treachery and deposed her from the regency. 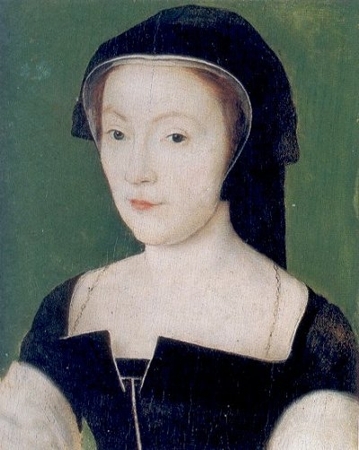 Mary of Guise died suddenly in Edinburgh Castle less than a year later, paving the way for an end to hostilities. 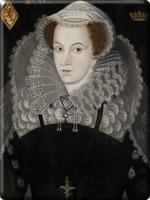 Under the terms of the Treaty of Edinburgh, signed by Mary, Queen of Scots' representatives in Scotland following the death of her mother, Parliament recognized the legitimacy of Elizabeth I's reign in England and ended the Auld Alliance with France. Mary, however, refused to ratify it. But while she could halt diplomacy, she could not contain the Reformation: in August 1560, Parliament repudiated the authority of Rome, forbade the celebration of Mass, and adopted a reformed Confession of Faith. 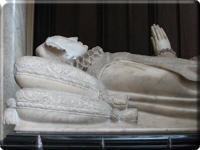 Mary returned to Scotland following her husband's death in 1561. 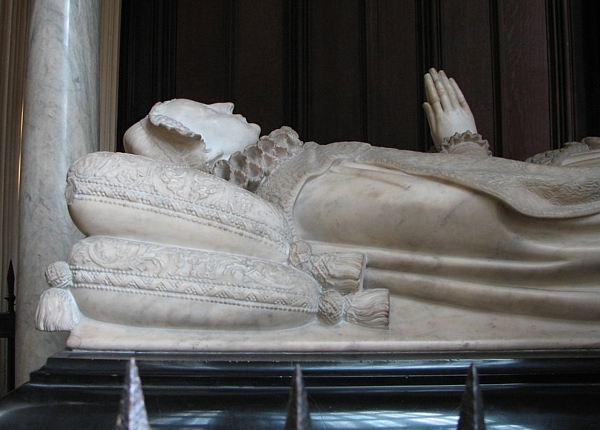 A devout Catholic, Mary was suspected by many of her subjects and by Elizabeth I of England. However, the young queen knew that she lacked the military efficacy to face her lords, and tolerated the Protestant ascendancy. Love proved to be Mary's undoing. 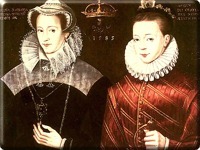 In 1565, she married her first cousin, Henry Stuart, Lord Darnley, with whom she was passionately in love. Not only was Darnley one of England's leading Catholics, he was also a claimant to its throne. A child of their union would become Elizabeth's heir. James Stewart, 1st Earl of Moray and Mary's half-brother, believed the marriage signaled a Catholic restoration and openly rebelled. Although Mary routed the rebellion, her marriage quickly deteriorated. Darnley was jealous of Mary's friendship with her private secretary, David Rizzo, and murdered him in front of her while she was pregnant. 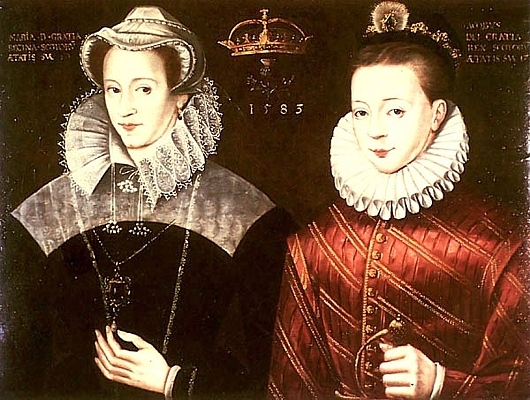 In February 1567, Darnley was killed in an explosion perpetrated by James Hepburn, 4th Earl of Bothwell and Mary's secret lover. When Bothwell and Mary married in May, the nobility rose against them. Bothwell took refuge in Denmark while Mary, captured by Bothwell's rivals, was imprisoned in Loch Leven Castle. In July 1567, Mary was forced to abdicate in favour of her infant son, Prince James. Mary sought refuge in England, where she soon became the focal point of a Catholic conspiracy plot to assassinate her cousin Elizabeth. 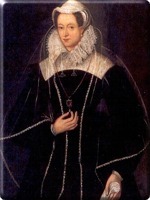 After spending eighteen years in confinement, Mary implicated herself in a second conspiracy in 1587. Elizabeth could no longer allow the existence of such a serious threat to her rule, and sanctioned Mary's trial and execution. The executioner needed two strikes to decapitate her.